TERRAFORCE: Your living concrete wall. Which block will you need? TERRAFORCE is a well-known and award-winning Cape Town-based company that offers interlocking concrete blocks (earth-retaining blocks) for environmentally friendly landscape retaining walls and erosion control. Is a member of the Concrete Manufacturers Association (CMA) and a Level Four BBBEE Contributor. Terraforce pioneered the hollow, reversible interlocking concrete block that is unmatched in its versatility, both in application and elevation. Suitable for commercial and residential landscape retaining walls, small or large. The wide range of plantable retaining wall blocks is tailored to create environmentally friendly domestic or industrial installations and to support sustainable development in soil stabilisation. Walls can range from light gravity retaining walls to geogrid reinforced earth-retaining or heavy gravity, double skin walls. Please Confirm availability of products with your local supplier. Refer to Product dimensions for dimensional details. Refer to Planning alternatives for shear key details. Refer to Setback charts for setback of retaining wall. 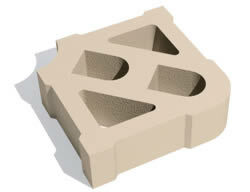 Please note: Most Terraforce Licensees use recycled concrete and clay bricks in the manufacture of Terraforce products. Please note: Terraforce suppliers stock their own selection/sizes of Terraforce concrete retaining wall blocks, this means the full range of products IS NOT sold at every outlet. 3/2019 – 40 years of commitment to technical excellence! Limited space and precipitous slopes called for some specialist geotechnical engineering in the construction of some of the concrete block wall structures in Bakoven on Cape Town’s Atlantic seaboard. Installed by Terraforce Recommended Installer, Dassenberg Retaining Systems. Initiated by the Department of Public Works as custodian of state land, this large retaining wall is located on the West Coast, Pepper Bay harbour area, to stabilize existing eroded embankments in the interest of public safety.